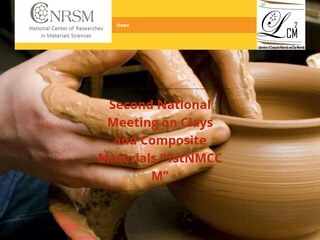 The Laboratory of Composite Materials and Clay Minerals in the National Center of Researches in Materials Sciences is pleased to invite you to its “First National Meeting on Clays and Composite Materials, 1st NMCCM”. The event will be held in October 2017 from 20 to 22th in the hotel “Nahrawess” located in the touristic area of Nabel. The “1st NMCCM” is an opportunity for local as well as foreign scientists to establish contacts with industrials working on the same fields. Sharing and discussing new findings on clays and their applications are the purposes of the meeting. The manifestation is also an occasion to set up eventual partnerships between the different actors.